doyounoah: Uh-oh..Tiger you have been busted! It started with a mysterious car crash and its ended with cheating allegations. It hasn't been a good week for Tiger Woods. Earlier today, Tiger, 33, released a statement to the press following allegations that appeared in US Weekly magazine that he had cheated on his wife. He said, "I have let my family down and I regret those transgressions with all of my heart. I have not been true to my values and the behaviour my family deserves." Last Friday, the world number 1 golfer, was involved in a car accident and knocked unconscious after hiting a water hydrant and tree. Florida police told a news conference that he would be charged with wreckless driving and could be fined about £100 and have four points taken off his licence. Celebrity website TMZ reported that his wife, Elin, scratched his face and chased after his car with, *wait for it* a GOLF CLUB. Could this story get any stranger?! It was alleged that the mystery car crash was linked to claims that Tiger had an affair with a nightclub hostess, Rachel Uchitel. What makes this story even worse is that Tiger's PR/Publicity camp refused to release a statement straight away, making the crash seem more suspicious, therefore leading to gossip websites running wild with rumours of what supposedly happened. Big Big mistake Tiger. Then, to make matters worse, a cocktail waitress has come forward and done a fabulous kiss-and-tell. It's not the crappy ones that wannabe-wags get away with. This one actually has EVIDENCE. US Weekly magazine claim to have the alleged voicemail Tiger left the woman, three days before the crash, to warn her that his wife had gone through his phone and "may call you". Jaimee Grubbs (you couldn't make that surname up!) claims to have voicemails, photos and up to 300 texts from the Pro Golfer. The 24 year old said of their relationship, "He told me just last month quietly and secretly we will always be together. He gave me the impression he and his wife had separate rooms. We never talked about Golf, sometimes we talked about his stressful life. He told me his life was overwhelming." "Although I am a well-known person and have made my career as a professional athlete, I have been dismayed to realise the full extent of what tabloid scrutiny really means. I am dealing with my behaviour and personal failings behind closed doors with my family. Those feelings should be shared by us alone." Meanwhile the other alleged mistress, Uchitel told the New York Post that she was "No homewrecker." The 31 year old said, "I have not had an affair with Tiger Woods. It's horrible to Tiger's family. His wife must feel horrible. The worst part of it, it's not true." She said she had welcomed Tiger to a New York club where she worked as Manager of VIP and they had met briefly "for two seconds". The longest two seconds of his life perhaps?!? US Weekly story running on their website..
Shame on Tiger's publicity team. Sack whoever is handling it, because they've done an awful job. Always, always realease a statement after an incident. Celebrities should learn from the Chris/Rihanna incident where rumours got out of control because neither of their PR teams confirmed or denied outrageous stories. 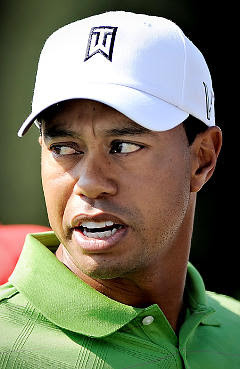 To hear Tiger Wood's voicemail click below...poor guy ...poor wife...he's soooooooo busted!